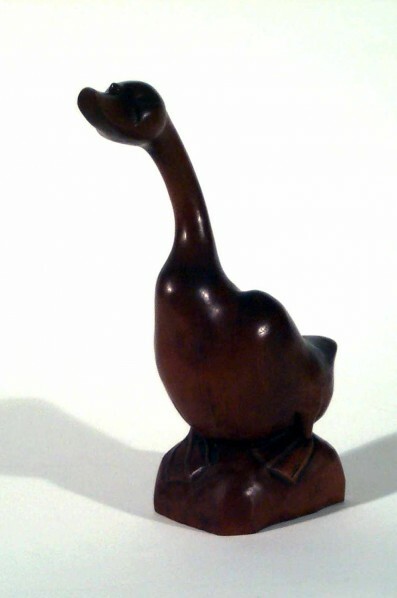 Artwork: Glenn Brown, Untitled Goose, Carved Wood, 9.75 x 7.5 x 3 inches. Museum Purchase. I thought it would only be fitting to do my last blog post for the art museum on my one of my favorite creatures – the goose. If you google information about geese, you’ll be met with a barrage of attack videos that only highlight their vindictive elements, completely overlooking the many wonderful aspects these birds hold. Geese, while known to plow down innocent bystanders, can be quite sweet and stunning creatures, features that Glenn Brown highlights in his wooden sculpture Untitled Goose. Though birds often go unnoticed in everyday life, they harbor quite a bit of beauty and grace that Glenn Brown showcases in artwork. Birds, in fact, help the environment in many vital ways, including pollinating flowers. According to the Audubon Society, more than 900 bird species aid in pollinating plants. Since these creatures fly further than bees and other insects, they also widen the range of plant life. Also, when insects are kept at bay by cold weather, certain bird species continue to pollinate. Even though some view birds as pests, Glenn Brown recognized the value of these species and carried this over into his artwork. This simplistic wooden carving allows the viewer to not focus on the negative aspects of geese but rather the intrinsic and natural beauty they hold. This piece offers a more pleasant, and certainly beautiful, look at birds for all.